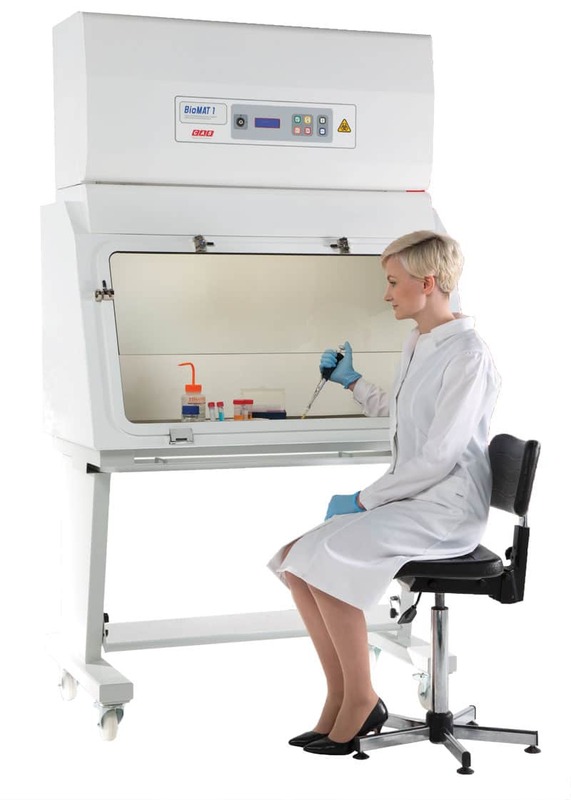 BioMAT1 Microbiological Safety Cabinets are manufactured in 2mm mild steel with a 316L grade stainless steel work surface fully welded and finished in “traffic white” RAL9016 powder coat paint. 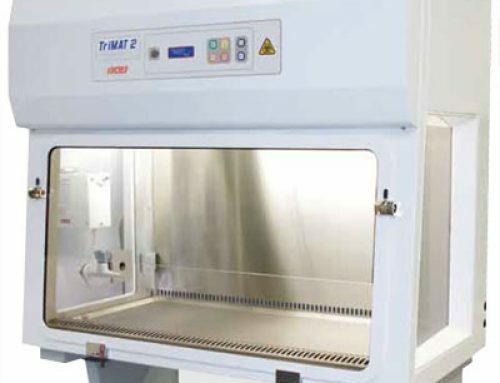 The wipe clean control membrane provides ON/OFF cabinet control, internal lighting and audible and visual alarms for low/ high airflow with mute function. A full colour TFT screen displays airflow diagram and alarm conditions plus clock function and programmable UV light timer. 2No 13A sockets are provided as standard within the main working area. • Ducted type: With exhaust module incorporating single HEPA filter and integral anti blow back damper. 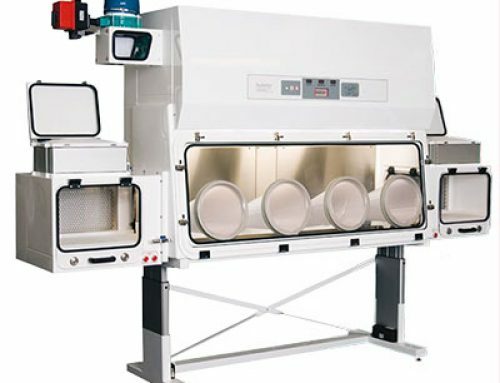 • Recirculation type: With exhaust module incorporating double HEPA filters and vertical discharge grille for return air. 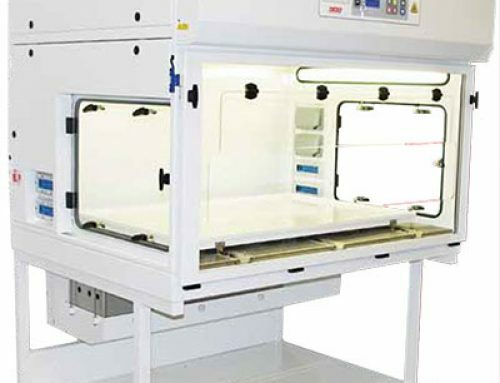 • Robotics Class 1: Large cabinet designed to house automated systems fully compliant with BS EN 12469:2000. • Class I/III hybrid type: With gloveport closure panel to allow high hazard work under negative pressure. 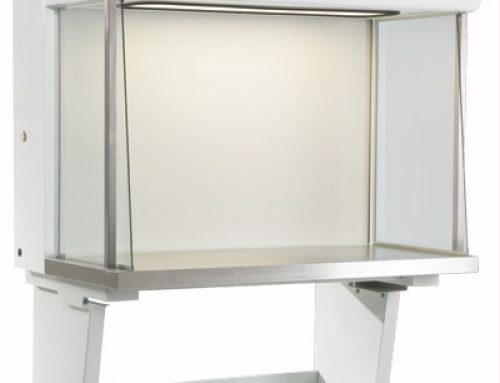 • Double sided: Cabinets to allow access from both sides. 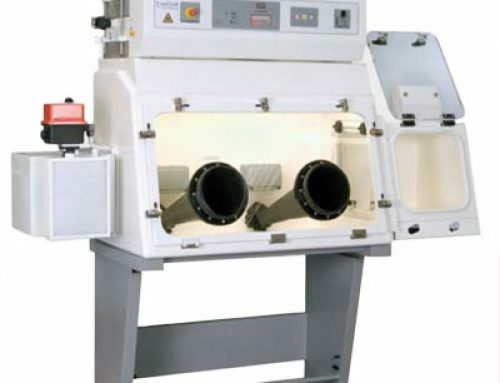 • TriMAT: Onboard bypass exhaust system to maintain constant exhaust volumes regardless of cabinet operation, designed for use within containment labs. • Support frame with levelling feet or lockable castors. • Service taps (vacuum, lab gasses etc). • 100% sealable night door. TFT screen showing airflow & alarm conditions. 2 mm grade 316L stainless steel with a white polyester finish (RAL 9010), wipe clean membrane. Simple to use, quiet operation & efficient. Wide range of accessories & options available.